then certainly a server is also present. Whether it is either a dedicated system or a normal pc/workstation acting as such. 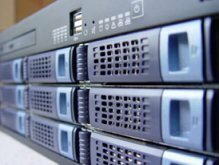 Whatever it is, a server is a most delicate piece of equipment that although it is generally built specifically to tolerate and resist faults, even more than the normal computer system, it needs professional attention in order to have it perform properly as it should in the first place. You have reached the right place where you can find the proper support required in order to plan, procure, install, configure and maintain your server. A team of proficient and experienced technicians are available to supply full server support for your home and office. protecting your data from unwanted intrusions such as mal / spy ware and hackers, among-st many other duties. Our server support will help you achieve the best performance by the right system for you, easily and efficiently. We also cater for any server concerned software together with any application you might want to apply for your use. The server support we bring you is also specialised on software topics meeting any type of exigencies. So, whether you have two computers back home which you want to connect together in order to share the internet connection and one of them has to act as a server or even if you have a dedicated high tech server administering hundreds of work stations spread across the globe, our server support will make sure you get the most from your hardware. will tend for all your requests thus rendering your service experience a friendlier one. ensure the maximum reliability and efficiency by your server and network on the whole. both you and your company and can easily result as a money / time and trouble solution.